Nova personally services all the machines she sells. Her goal is to keep these machines sewing for many years. Nova's prices begin at $375 and go up from there. Price is determined by cosmetics, collector's edition machine, and scarcity of a particular type of machine. 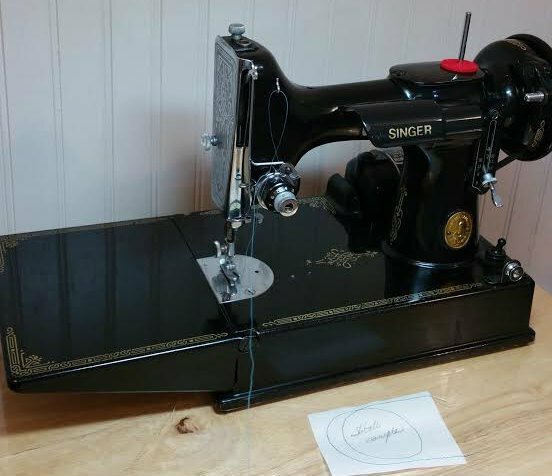 Nova will post machines here on this page as she services the machines and sews on them in preparation for selling them. So, if you are interested in purchasing a quality machine, that you know has been serviced by someone knowledgeable and that specializes only in these machines, watch this page regularly. The machines that become available will go to "first come, first served". Why should you buy a machine from Nova? 1) Nova is a reputable dealer who will stand behind the machines she sells. 2) Nova knows whether or not the sewing machine she is selling you actually sews. You will not purchase a machine from Nova that needs repair and parts. She personally services and sews on all the machines she sells. 3) Nova offers a live Skype demo of the machine you are interested in so you can see it sew and hear it. 4) Nova knows how to safely ship and handle the machines she acquires and sells. A machine improperly packed will incur major damage in shipping. What do Nova's customers think? I LOVE MY NEW MACHINE!!!! I used it all day long yesterday and it works like a dream! You are right - it is so quiet! The two of us will be very happy for many years to come! Thank you Nova! You are one of a kind and I'm so glad I have had the chance to meet and work with you. My beautiful featherweight arrived safe and sound. Thanks so much. I appreciate the careful instruction and care you took in showing me the machine over Skype. I will be singing your praises to all of my quilting friends. Nova carries a full line of Singer Featherweight Parts and Accessories. Click here to be taken to her online store. Then click on the headings shown to be directed to the various departments for parts and accessories. Be sure to check out Nova's Featherweight Tip of the Month! It has great information you can use with your Featherweight.